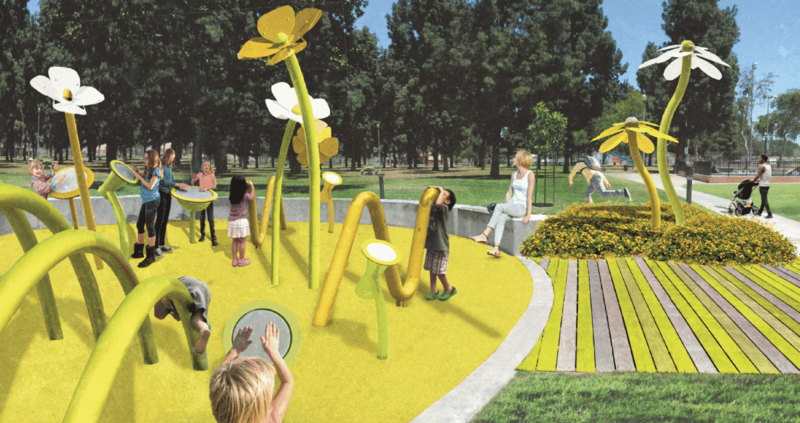 A rendering of the Sound Garden to be featured at Houghton Park in North Long Beach. Courtesy of City Fabrick. A $100,000 park addition dubbed a “Sound Garden” will be installed at Houghton Park and break ground today, cementing a partnership between the Long Beach Community Foundation and the City of Long Beach’s 9th District. Marking the completion of the $1.35 million Atlantic Avenue Connected Corridor project that the foundation launched more than a decade ago in the fall of 2007, the Sound Garden will be a child audiophile’s dream that incorporates park equipment and furniture that interact and create differing sound waves. The Corridor project, designed to connect the myriad differing neighborhoods that run along Atlantic, stretches from Uptown to Downtown—and when it came to the project’s budget, additional resources were left and the foundation sought to “cap off” the project with some form of an art installation. Originally proposing to install a water feature at Michelle Obama Library, 9th District Councilmember and Vice Mayor Rex Richardson stepped in to see if the Corridor project could align itself with Houghton Park’s updated master plan. Houghton Park has long been dubbed “the soul of North Long Beach,” a space that acts as an epicenter for community and connectivity. That connectivity has largely been thanks to the Community Center at its core, which was built in 1930, updated in 1959, and then expanded in 1987. This year, an entirely new community center broke ground and, when completed, will offer 6,500 square feet of new space while connecting to the existing historic center through a breezeway. Richardson said plans for a major new playground are not off the table but that he is working diligently to find funds for the project. As for the Sound Garden, a small but necessary step toward improving Houghton Park, the foundation applied for a permit to construct the space itself, with completion expected within the coming months.